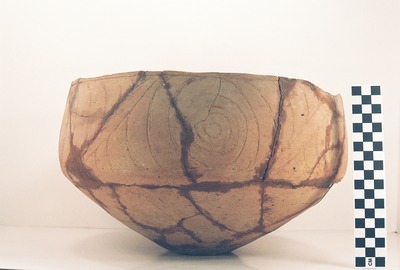 "41AN2-44, Burial F-2" by Timothy K. Perttula and Robert Z. Selden Jr.
DECORATION: There are two distinct engraved motifs on the rim of the vessel, each executed two times. The first is an oval with small inward pointing hatched pendant triangles. This alternates with a hooked arm scroll motif with curvilinear and diagonal fill elements that extend to two curvilinear engraved lines that further define the ovals. The body and base of the vessel has diagonal and overlapping brushed marks. Poynor Engraved, PP variety carinated bowl (Vessel 41AN2-44).